In the evening of 25th November 2014, when television channels flashed the news of a 72% voter turnout in the first phase of the Kashmir Assembly Elections, the entire nation was pleasantly surprised. The election of the members to the Legislative Assembly of the Jammu and Kashmir state is being held in five phases commencing 25th November 2014. The total number of seats in the J&K Legislative Assembly is 111, of which 24 seats fall in the regions occupied illegally by Pakistan. Hence the election is being held only for 87 seats, as the Election Commission is unable to hold elections in the 24 seats, occupied illegally by Pakistan. As against the five-year term for their counterparts in the other parts of India, the term of office for these legislators is six years under the 'Constitution of Jammu and Kashmir'. The major political parties in the state are the National Conference (NC), the Indian National Congress (INC), the Bharatiya Janata Party (BJP) and the Jammu and Kashmir People's Democratic Party (PDP). The results will be declared on December 23, 2014. J&K State has three regions, viz. Jammu, Kashmir and Ladakh. The current population is around 13 million, of which nearly 7 million are eligible voters. On 15th August 1947 immediately after the independence of India, all the princely states numbering more than 560 were acceded to India due to the indefatigable efforts of Sardar Vallabhai Patel and V.P. Menon. Jammu & Kashmir was handled directly by the Prime Minister, Jawaharlal Nehru. 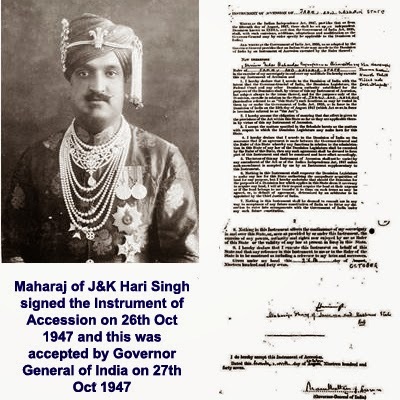 The Maharaja of Jammu & Kashmir, Hari Singh signed The Instrument of Accession on 26th October 1947 and the same was accepted by the Governor General on 27th October 1947. Though 2.2 lakh sq. kms of land was handed over to India through The Instrument of Accession, only 46% is now available in India's possession, due to some historical botches in the early years after independence. The first elections were held in 1951. With the boycott of all the political parties in the elections (due to the rejection of valid nominations), the National Conference headed by Sheikh Abdullah, won 75 out of the 75 seats. Although all the 560 princely states became part of Union of India smoothly, accepting the Indian Constitution, the then Prime Minister, Jawaharlal Nehru and Sheik Abdullah had an ‘understanding’ which is known as the ‘1952 Agreement’. This understanding provided more power to J&K to make laws, conferring special rights and privileges to the state subjects. This was debated in the Lok Sabha in July 1952. All the opposition leaders did not favour this ‘understanding’. No written agreement is available in any Government records. As per this new constitution, many of the Indian Laws are not be applicable in J&K without the concurrence of the State Government. The Head of the State Government was called the Prime Minister, and later renamed Chief Minister in 1965. The subsequent elections for the Legislative Assembly were held in March 1957. Till 1977, elections were held once in 5 years. Through an amendment in the J&K Constitution, the term of the Legislative Assembly was extended to 6 years from 1977. The Indian Election Commission was given the jurisdiction to conduct elections by another amendment to the J&K Constitution in 1965. The first Lok Sabha Members were elected from J&K only in 1967. Earlier, only nominated members represented in the Lok Sabha. In the militancy and separatist movement in 1988, more than 4 lakh Hindus were displaced from the Muslim dominated Kashmir Valley. They had to move out of their villages, leaving behind their lands and houses. “It is a shame for all, that a citizen of this nation had to move out of his own place and live in a relief camp like a refugee, in his own country”, said Yajjin Bhatt, one of the migrants from Anantanag and presently living in Delhi. All their properties in Anantanag were forcefully occupied by the local people, without any compensation to the evicted. Although the Election Commission allows these displaced people to vote in the elections by setting up special booths at Jammu, Udhamput and Delhi, not many migrants have voted as they did not register themselves as voters. Many of the migrants from Kashmir Valley have moved to various parts of the country; perhaps they had opted to enroll themselves in the states/places where they chose to settle, instead of going to the special booths in the specified places. During the partition in 1947, thousands of Hindu families came from West Pakistan and settled in the Jammu region. Sadly, these refugees (presently 3 lakh people, mostly belonging the Scheduled Caste and the Dalit community) are not able to vote in the elections for the Legislative Assembly and Gram Sabhas, due to some restricting clauses in the J&K Constitution. They are also not allowed to pursue higher studies in J&K. They are however, eligible to vote in the Lok Sabha Elections. These people have since been fighting for their rights in vain, for more than 60 years. Ranjan from Haryana, a researcher on J&K issues, says that there is no reservation for the SC/ST candidates in the Kashmir Valley region for the elections. “The Government does not follow the reservation policies for SC/ST/OBC as followed in the other parts of India. Though J&K has more than 14% ST population, the state does not have any reservation for STs as provided in the Indian Constitution. Many of the important Indian constitutional provisions like fundamental rights, right to education, the Panchayat Raj, the Central RTI Act, are not applicable to J&K, due to Article 370”, Ranjan adds. During the past 25 years, no films have been screened in the theatres of Kashmir valley, due to the presence of militants. If a Kashmiri woman marries a person outside J&K, the spouse and the children are not eligible to vote in the elections for the Legislative Assembly. Although the Central Government provides per capita central funding to J&K to the extent of more than 8 times as compared to the other states, there is no visible development in the State. “Maladministration and corruption are mainly responsible for the siphoning of these central funds. Only 50 families in the state are the beneficiaries”, adds Ranjan, with a sense of helplessness. Militants and separatist organisations have been relentlessly trying to influence the people of Kashmir Valley. However, in the recent days, the people have started thinking about the need for development in the state. Some of the separatist groups too have started feeling that integrating with India could provide them better opportunities. The excellent work done by the Indian Army during the recent floods, by saving thousands of lives, has given the people an inclination towards integrating with the rest of India. The elections in the state upto 2002 were allegedly marked by rigging and violence in order to give an edge to some of the political outfits. Since 1988, the people behind the separatist movement threatened the voters against participating in the elections. In this backdrop, the Legislative Assembly elections of 2002 and the Lok Sabha Election of 2004 were landmark elections in the history of J&K, setting the trend for future elections, with a virtual slap on the face of separatism. “There were many complaints about the conduct of the previous elections. Prior to 2002, the militants threatened the people against participating in the elections. They had even put up posters of the image of a coffin as a threat, to create fear. The paramilitary and the army were deployed to sensitise the area and to remove the fear of the people. The people have realised that the Indian experience was better than the Pakistan experience. The turnout was more than 45%, which was a commendable record, considering the overall tense situation prevailing then. It was a free, fair and transparent poll conducted in the presence of international media and foreign diplomats. The then American Ambassador in India, Robert Blackwill commended India for her commitment to hold free, fair and inclusive elections in J&K without violence”, recalled T S Krishna Murthy exclusively to PreSense. T S Krishna Murthy was then the Election Commissioner, who supervised the 2002 Assembly Elections, and later the Lok Sabha Elections in 2004 as Chief Election Commissioner. The Kashmir Valley region has 46 seats, the Jammu region has 37 seats and the Ladakh region has 4 seats. Although the delimitation has been implemented in other parts of India, it is yet to be implemented in J&K. Around 7 million voters will now be casting their votes to elect their new Government. With the free, fair and transparent election process, the nation now awaits hopefully for the newly elected Government to resolve the problems of J&K. It is very encouraging to see the voters enthusiastically participating in the elections, braving the threats by the extremists. We hope the same enthusiasm will continue for integration of J&K with the rest of the nation.